The Andhra Pradesh government is playing the number game. Exploiting the fancy among Telugus to own a vehicle with a fancy registration number, the transport department’s auctions now earn it a whopping Rs. 2 crore annually. The last four digits numbers are unique to the vehicle. Special lucky numbers such as 3333 or 6666 fetch a high premium. 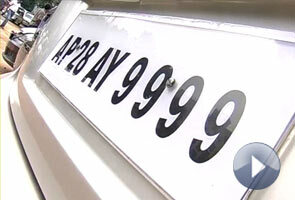 9999 is the most sought after number in the state. Motorists are so keen on getting the fancy number that the number was recently auctioned for six and a half lakh rupees. The fee now is Rs. 50000 for these four numbers; ten years back it was only Rs. 5000. Even if it’s made 50,000 people don’t mind paying for these numbers? People today follow Numerology which suggest them to own vehicles, house or mobile numbers which are lucky to them. We can say people are sentimental. What do you call it Superstition or Fashion?